There has been considerable progress in the past months. While the most noticeable progress has been with the scenery, wiring to get the layout ready for detectors has been proceeding quietly "behind the scenes". I was over at the club today helping Bill Payne install wiring and a mockup panel for LEDs to show track occupancy between Meaford and the Camperdown siding. Martin and Doug Date were doing the install of the panel for the helix to show where the trains are on the hidden helix tracks. Helix panel ready for installation. Martin uses Microsoft "Paint" to draw his schematics. 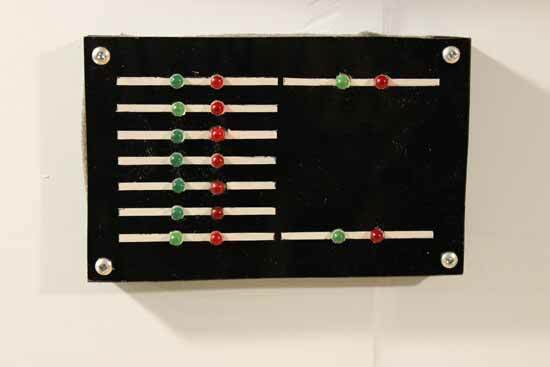 The panel will show operators where the trains are as the climb or descend the single track. The approach tracks at top and bottom are on the right. A train can only enter the helix if the approach tracks are clear. 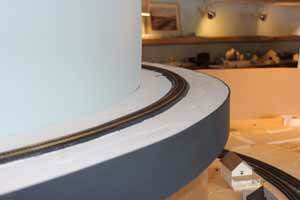 Other panels will show the tracks and passing sidings before the approach tracks. Mockup on foamcore with striping tape. 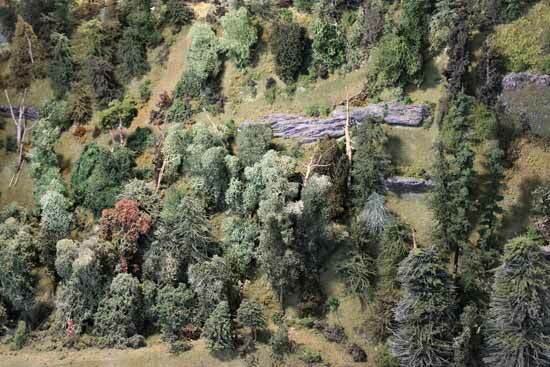 Either the main or the siding and the helix tracks must be clear to descend the helix from Camperdown. The trackage cannot be seen from Meaford, hence the need for a panel. We may add trackside signals even though CNR did not use them here in the 1950s. 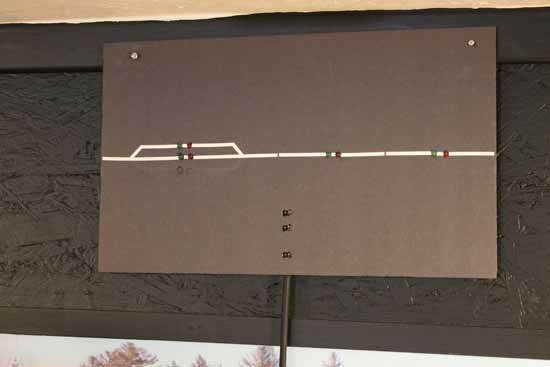 Although unprototypical the signals would help operators visualize the trackage and would be cosmetically attractive. Jay has become our master scenery guy. His creativity and attention to detail is strikingly obvious when you study these photos. 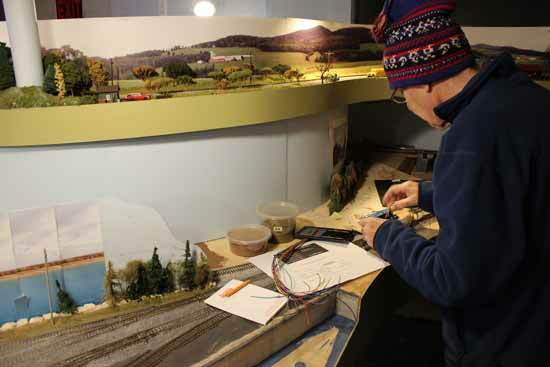 He has completed the scenery on the top deck between Meaford and the top of the helix to the lower level and has moved on to the Collingwood area on the lower level. 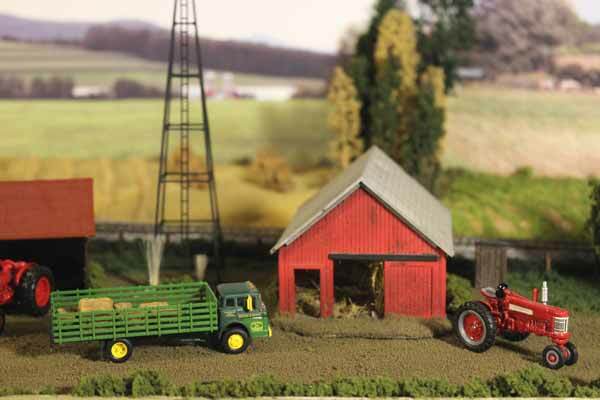 Typical farm scene along right-of-way before helix. 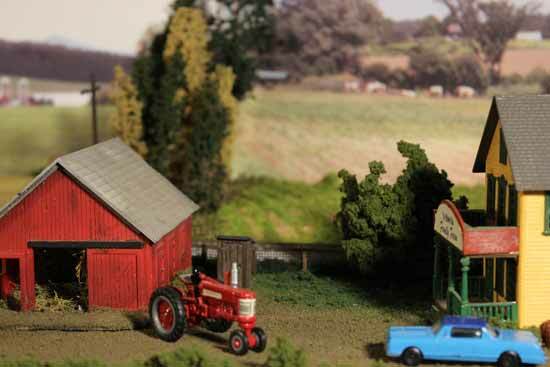 Trackside shed with farmer makes the helix more interesting. Lumberyard as the main curves into Collingwood. Paper houses mounted on black foamcore to make use of the shallow depth behind the mainline entering Collingwood. Other club members have also been adding to the scenery. Al White's campground at Thornbury that reflects a real campground that existed in the 1950s. Work on the Collingwood harbour continues with installation of the water. (The styrofoam holds trees waiting to be planted). We had a practice operations sessions a few weeks ago to work out some bugs. It was an opportunity for Peter Shelton to try out his new Raspberry computer with jmri and for some of us to run a few trains using our tablets. I had TSM-West (Thornbury, Stayner, Meaford) with a few cars to switch. It was difficult to drive the train and film the action at the same time so some of the focus is less than ideal. However, the scenery is getting better every week thanks to Jay Parkes, Bill Hanke, Barry Jack, Jim Alexander, Barry Ruse et al, especially around the Blue Mountains and on the upper deck to Meaford. I continue to work on the Thornbury downtown buildings as Martin Alborough manages to find time to draw them in Skethchup and print them on our 3-D printer. Here's a short video following TSM-West. I shot this video of our travelling HO layout at the 2018 Barrie Train Show. Lots of action. Here's some drone footage of the clubhouse and layout that Bill Payne took in August, 2018 that shows a "bird's eye" view of the railroad. Work has progressed significantly since I first posted a video in 2017 so this is an updated version of the layout itself. It gives a general idea of what the finished layout will look like. 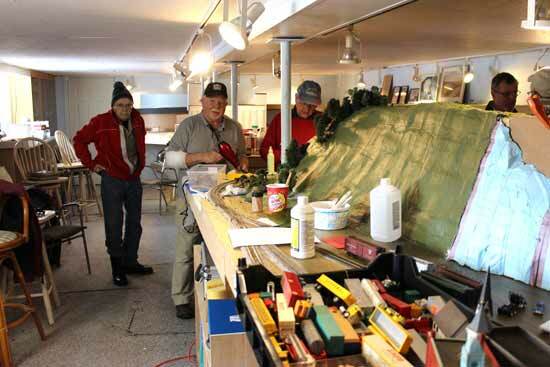 Our Nottawasaga Model Railway (NMR) Club is building a new model railway at Bygone Days in Collingwood, Ontario, Canada. More about the club can be found on the NMR page. This page is devoted to the new permanent layout started in 2015. By September the basic benchwork had been installed and we were starting the helix construction and laying down the first roadbed. Brad Lebeck is our overall designer and foreman. As a superb carpenter by trade his construction methods are terrific. He leads. We follow. John Houghton is taking the lead on installing foam roadbed, wiring and electronics while George Warren is leading the crew building Fast Tracks turnouts. We've started with the helix that will take track up to the next level which will be the mainline to Meaford from Thornbury. The bottom of the helix is the connection to Collingwood rail yard. Before doing Collingwood it was necessary to begin the roadbed between the west wall and the helix otherwise it would be very difficult to lay the track. The first loop of the helix has to be completed before making the additional loops. 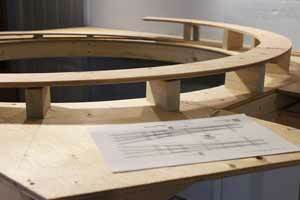 The plywood on the helix will be super-elevated along the outside edge. Transition easements are built into the curves. A second crew was laying the template lines for the Collingwood yard. We have picked up some new members after moving to Collingwood from our old clubhouse. 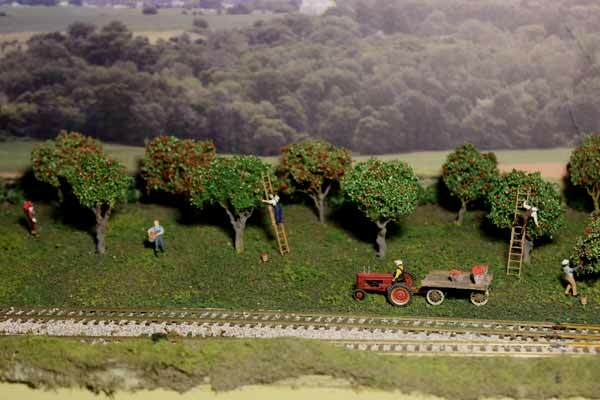 We are now 23 in total and now have lots of willing hands working on the layout. Work is progressing quickly now that we have access to the clubhouse throughout the week. This was where we were with construction as of November 11, 2015. The helix trackage is super elevated so that the outside rail is slightly higher than the inside rail to improve tracking on the curve, just like on the prototype. 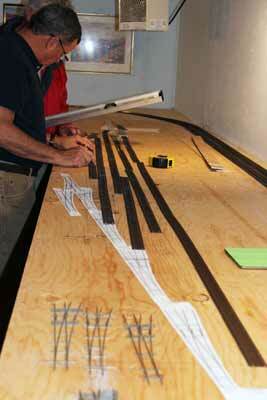 Meanwhile laying out the trackage for the Collingwood yard begins. Collingwood will be the showcase on the layout and laying out the turnouts is critical. The paper templates are from the Fast Tracks website. Several #6 turnouts are in the foreground. These are being constructed in Fast Track jigs. As we have a lot of turnouts to make, an assembly line was set up where ties are pre cut to length for the jig and placed in numbered paper cups. 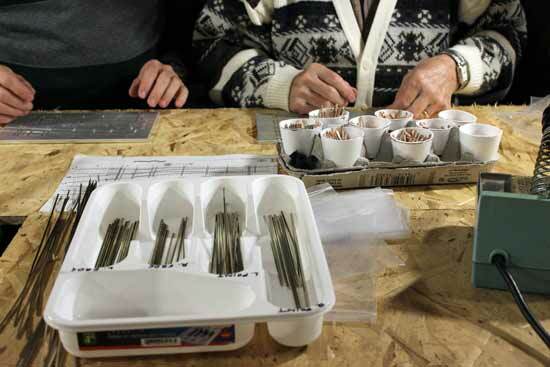 The tray holds rail ciut to length for the frogs, point and stock rails. John Houghton presented lessons on how best to solder together the turnouts so that some of the members who were interested in this aspect of the hobby could try their hand at making turnouts. A paper template and a jig are in the background of the photo. Fieild trip to measure the bridge at Angus, Ontario. 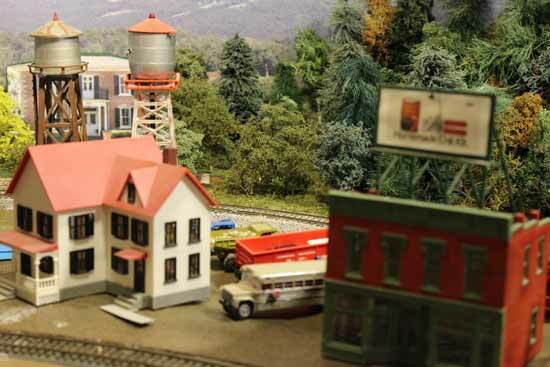 Another aspect of building a prototypical model railroad layout involved field trips to photograph and measure structures that need to be scratch built. 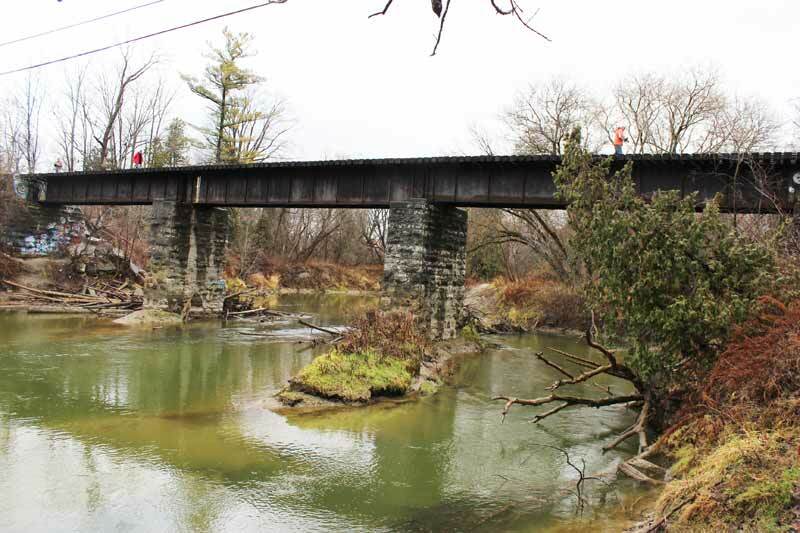 This steel bridge is on the former CN line that became part of the Barrie-Collingwood railroad, now abandoned. 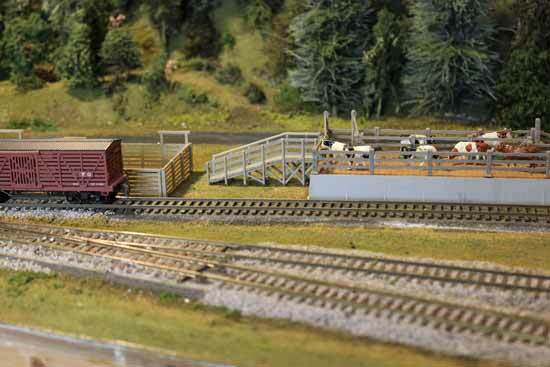 We need to build this bridge for the layout. Measuring the height of the bridge above the water. In the photo Martin Alborough and George Warren are measuring the bridge height above the water that turned out to be about 30 feet. 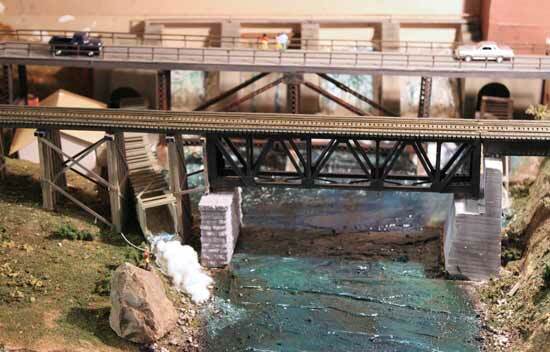 We will have to selectively compress the length of the bridge which would be over two feet in HO scale. I took this photo from the east side of the bridge to get a better overall look of the spans and stone piers. 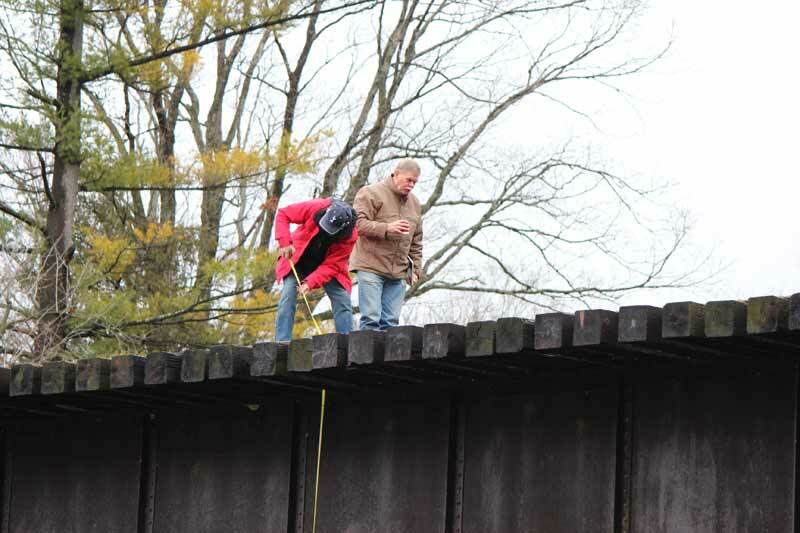 Some of the six members of the group are measuring the bridge. This bridge is not in use so there was no problem in walking across it. This scene will make for some interesting scenery. January 2016 saw significant progress in track work. We are trying to be as accurate as possible, although with some "selective compression". 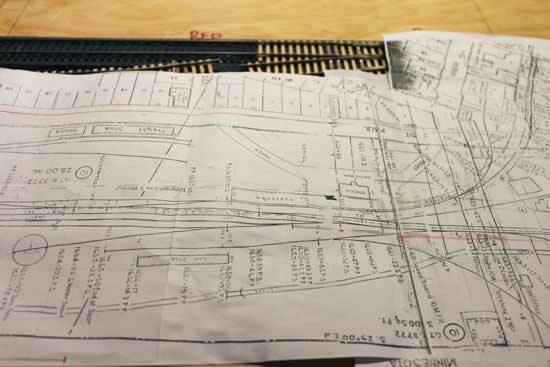 We have obtained blueprints and survey maps of key locations such as the trackage and downtown area of Collingwood as shown in the photo. This is our guide to laying out the track and the location of buildings and streets. 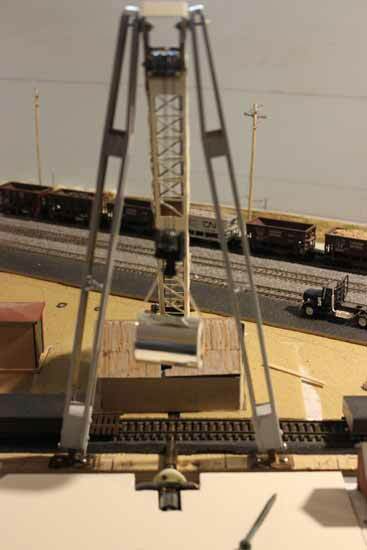 Some members are already beginning work on scratch built structures such as the rail bridges and industries. 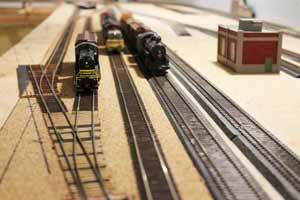 We've added some excellent modellers to the club like Jay Parkes. 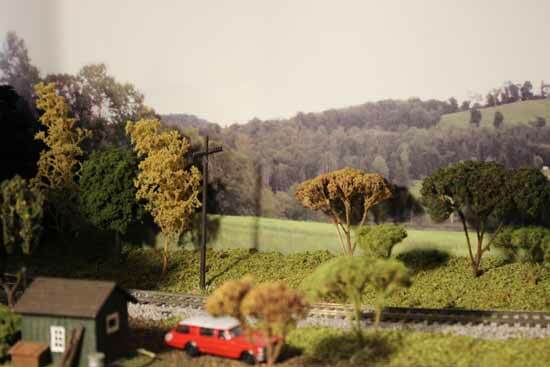 Here is one of his early dioramas of actual industries he built for his own model railway. He brought it over to the clubhouse to show us his work. We have a number of cabinets that we inherited and our intention is to fill them with interesting railway items, artifacts and books. 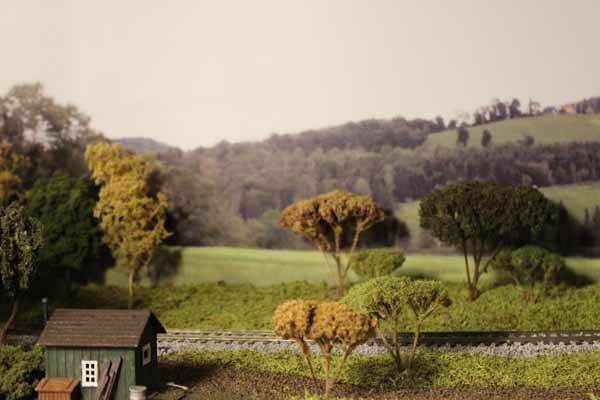 We also plan to have a small lending library for members of railway books and modelling magazines for those conducting research or trying their hand at scratch building and kit bashing. This steam whistle was found in one of the Bygone Days buildings. It looks like it came from a switcher. Martin Alborough started cleaning it up and Brad Lebeck is going to try to get it working with a friend's steam tractor. We invited our wives to view what has been accomplished up to March, 2016. They were continuing on to Martin and Pat Alborough's house to plan for our upcoming annual auction the first Saturday in May. The women take care of the kitchen where homemade goodies make it a profit centre for us at the auction. John Houghton had worked very hard in recent weeks to get the mainline operational so we could test some trains and have something running. This is a major milestone for anyone's layout. 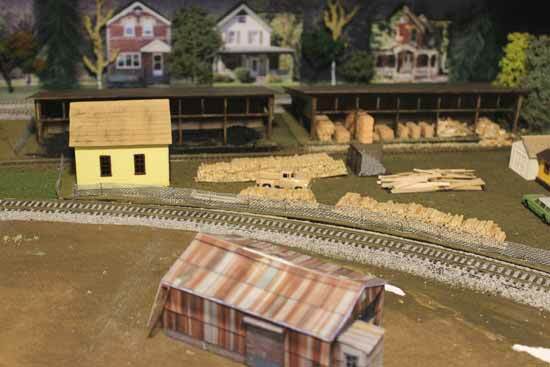 Some of the buildings from our previous layout were scattered about to"sit in" for the correct scratch built buildings yet to be constructed. Freighter in Collingwood harbour by the grain terminal. We also had a stand-in for the Collingwood grain terminals and a Great Lakes freighter is positioned in the harbour. 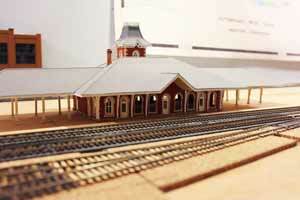 Brad Lebeck also brought his custom built model of the Collingwood railway station. Footprints for other buildings are being researched, drawn and positioned before mockups are constructed. Meanwhile work continues on the track and electrical hookup. 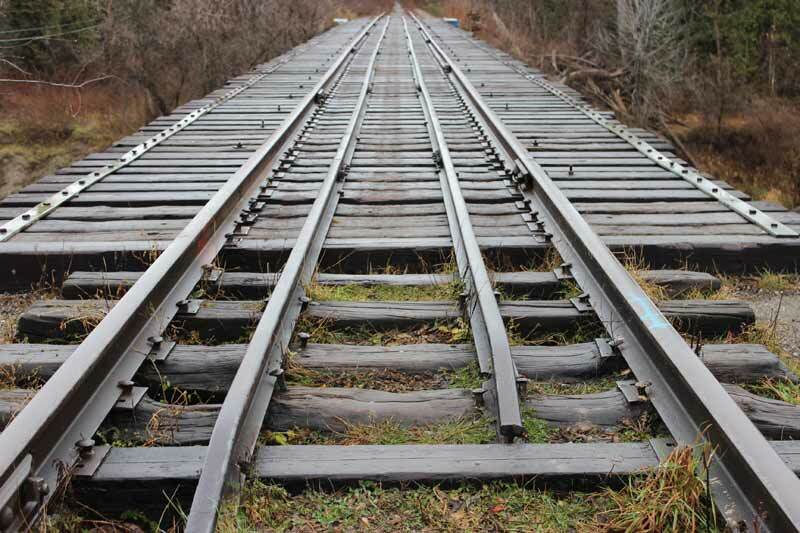 Track painting and ballasting will begin later this Spring. I took on this scratch building project that was a combination of two steel spans and a wood trestle. I have a construction article at the bridge construction page. You can see our ongoing work on the Thornbury dam at my page about construction with a 3D printer. 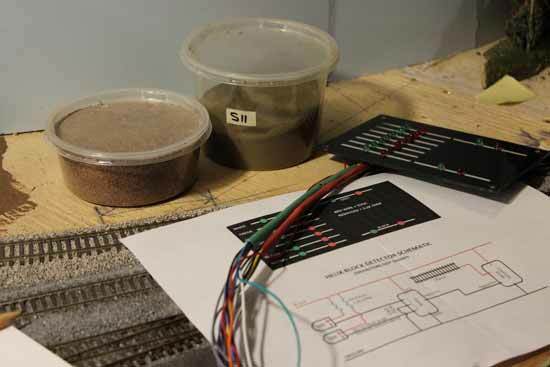 An aside about "speed matching"
Considerable progress was made in building benchwork, installing track and electrical, scenery landforms and setting up jmri for beta testing of the layout. Behind the scenes members continued to work on various projects such as the grain terminal, stations, and other historical buildings. 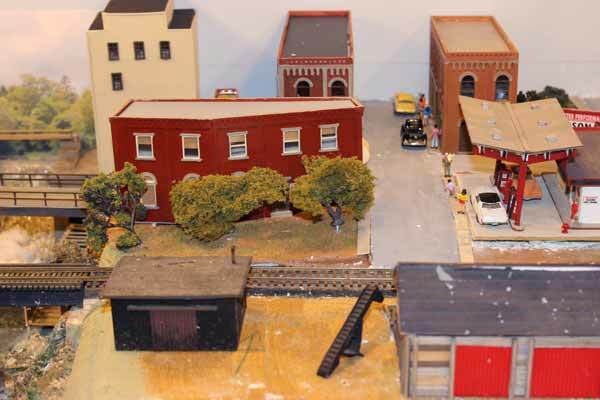 For now many of the buildings are either mockups or old buildings from our previous layout. These will be replaced as we move forward. We had our first visiting railway club and an open house for a local corvette club. Here are a few "in progress" photos. The helix loops behind Stayner lifting the track to the Meaford upper deck. The upper deck above Collingwood looking across the aisle from the harbour. Barrie-Allandale staging yard with some temporary rolling stock for testing track. 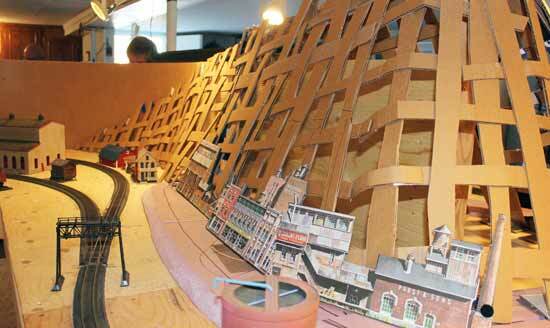 Cardboard lattice for the Blue Mountains scenic divider behind Thornbury. 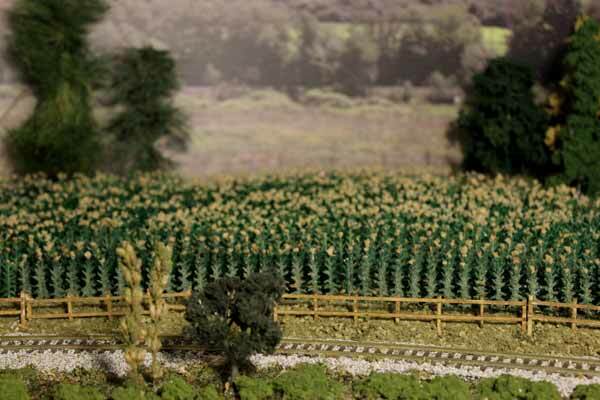 The plan is to model the Canadian four seasons on different sections of the layout. The Blue Mountains area is a prime ski location north of Toronto and a ski train used to take skiers up to Craigleith Station. The station still exists and is now a museum. 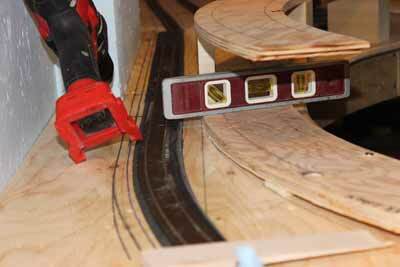 A model will be built for the layout. Here is a detailed explanation by John Houghton of how he made manual throws for Fast Track turnouts. During a Monday night work session in July, 2016 we ran some trains to test the track work and the jmri operating system using iPads and other tablets. We introduced new members to jmri manifest operations. This was simply a "beta test" to see how the railway ran. Some of the scratch built structures are already in place. Others are cardboard mockups while research continues to locate drawings and photos of the locations in the mid 1950s. Here is a short video to whet your appetite. 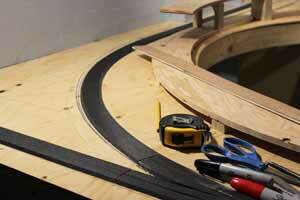 Bill Hanke has finished the helix carpentry and the track has been laid. It has been a busy winter at the club. All the track is in and wired up to Meaford. Only the turntable at Meaford still to add. John Houghton is working on that but he is also our main man on the track turnouts and electronics. All the turnouts at Meaford have been electrified because some can be hard to reach for some members. A tree-making work session. The mountain needs a lot! Extra volunteer work sessions have been conducted to speed progress. Here the "tree-making gang" led by Jim Mulcock with Barry Ruse and others has started work on the mountainside behind Craigleigh. On the far right behind the mountain divider Jay Parkes is busy building mockups for the buildings that serviced the Collingwood shipyard. 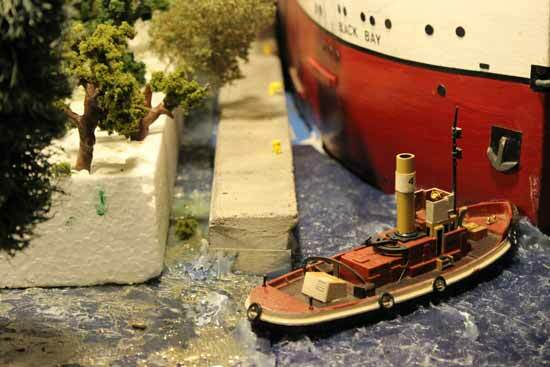 Harbour mockups built by Jay Parkes. The upper level leads to Meaford. I have been continuing to work on the Thornbury dam with John Houghton's assistance. John is our SketchUp expert and is in charge of the 3D printer. 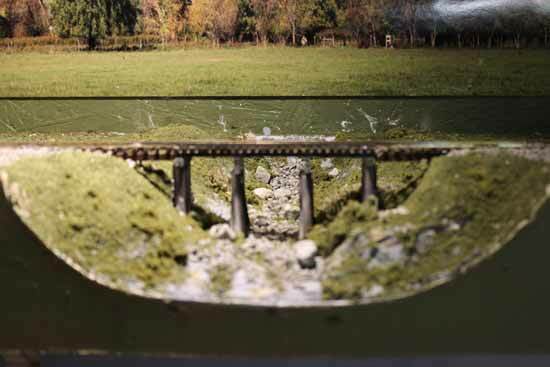 Sections of the spillways for the dams were made on the 3D printer. I assembled the sections and added Woodland Scenics water effects. Cotton batton was used for the waves at the foot of the spillways. 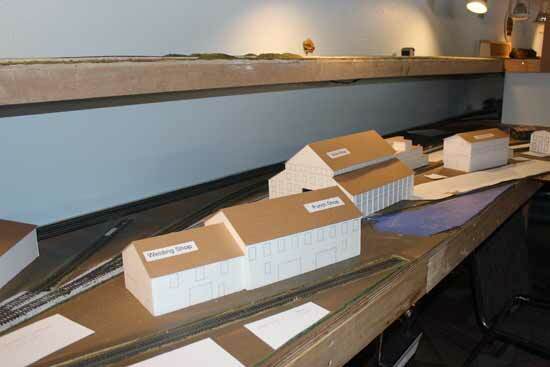 I also built mockups for the mill building on the right side and the pump house on the left. Sluices carried the water to the mill and the power station. I made these from styrene. 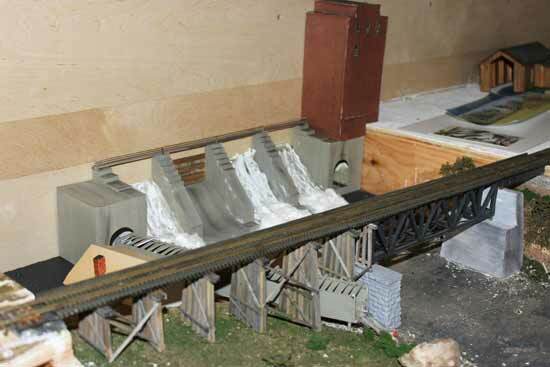 There is still some scenery to add and the water between the dam and the railway bridge. The road bridge has to be constructed to fit between the dam and the railway bridge. It has to pass above the pump house. The space is condensed so I am taking a few liberties in making the scene and trying to get it to "feel right". Al White has a book about Thornbury that contains some old photos of the area. They are difficult to interpret but we're getting there! After installing the dam I turned my attention to the water beneath the dam and in the river. For the first time I tried the "toilet paper with white glue" method for creating ripples and waves. There is a tutorial on the internet if you Google waterfall construction on YouTube. The method is quite easy and very inexpensive. Here's how. Lay down a layer or two of toilet paper sheets where you want the water. Cover with a 50/50 mixture of white glue and water by brushing on with a semi-stiff brush. Dab at it to shape the ripple effect you want. Let it dry thoroughly for a couple days and follow up with acrylic colours. I brushed on burnt umber near the shoreline followed by shades of green, blue and black as I feathered the paint out to the deepest parts of the river. I also dabbed a little green on the white areas I had painted on the water cascading over the dam. After the paint had dried for a few days I brushed on a clear coat of Varethane to add shine. The YouTube video suggests adding another coat of the glue mixture followed by four or five layers of the gloss coat to add more depth. I haven't done that yet. I moved on to building the road bridge. The road bridge is between the dam and the railroad bridge. In reality there is more distance between the two bridges but I was restricted in the space I had to work with. Aren't we always? I had to use "selective compression" to squeeze in the road bridge and the pump house. I also narrowed the bridge to about 14 scale feet to get it to "feel right". The old picture we had of the bridge is difficult to interpret but it appears to be built on a few upright girders. Again I had to compress the bridge supports as I "imagineered" the construction. I dipped into my spare parts treasure box to find some concrete bridge pillars and leftover steel beams, the MicroEngineering plastic ones. My idea was to create a credible replica of the overall scene even though some of the features aren't perfect. For example, member Al White remembers there was a concrete apron around the right hand railroad bridge pillar where people could stand back in the 50s to go fishing. I don't think they dove into the river to swim from here. I have installed a fisherman on the left hand bank as shown in the photo. The bridges are level with the dam. I didn't get a great angle when I composed the photo but it gives a sense of the overall scene at Thornbury. The road bridge at Thornbury completes the dam scene. A family is gazing at the dam. My next project was to construct the coal shed that sat beside a siding on the eastern side of the railway bridge. I have described the project on a separate page named coal shed. The first pile trestle near Meaford, Ontario. There are two short pile trestles on the way up to Meaford. They both still exist as part of the trail system which allowed Al White to take pictures and measure them. I used Microengineering bridge track supported under the rails on Evergreen plastic 12" x 12" stringers. The bents were cut from wooden dowels and the cross bracing was dimensional lumber. This trestle used 5 logs per bent. The other one, slightly shorter, used six but only one centre bent. Martin Alborough assisted Jay Parkes in adding the scenery. Jay is "in charge" of work along this stretch and is also responsible for installing the photographic backdrop. 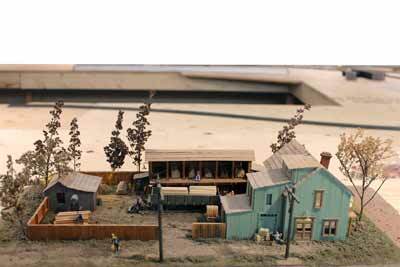 Here are a few more of the semi-finished scenes on the layout. Barry Ruse leads the team building The Blue Mountains that acts as a scenic divider. 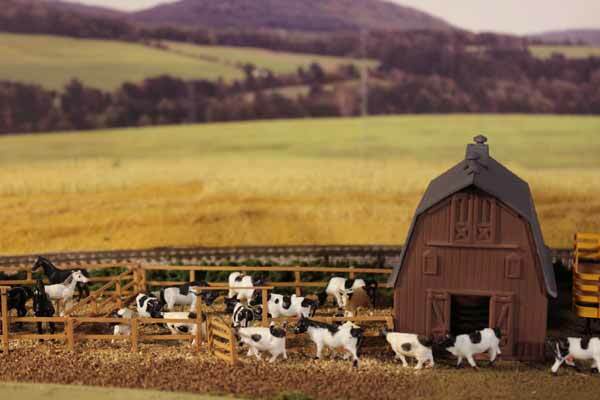 The cattle pen was located in the Thornbury area. Bill Payne's operating shear legs at Collingwood harbour. Bill Payne is building an operating model of the shear legs that were used in Collingwood harbour to load and unload ships and barges. This is still a "work-in-progress" as he still needs to use our 3D-printer to complete the lattice on the legs. He is working from original photographs and has built an ingenious mechanism to allow the legs to slide forward and back to position loads above the barge that he is also constructing as part of the scene. The tracks in the background lead to the famous Collingwood grain elevators that were in use during the period we're modelling. The elevators still stand but are no longer in use. The layout was on display to the public on July 1, 2017 to help mark Canada Day. We had 65+ visitors (rough count) and picked up 2 new members. There's been a lot of progress in many departments during 2018. Obviously the most noticeable is the scenery. Jay Parkes and his helpers have almost completed the upper level run up to Meaford while Barry Ruse and his crew have concentrated on the Craigleith and Blue Mountains area. I have been busy with downtown Thornbury using Martin Alborough's help with our 3D printer. Al White is working on the other side of the bridge at Thornbury and Bill Payne has been adding to the harbor scene around the shear legs he built. Below are some photos of how the layout is looking. 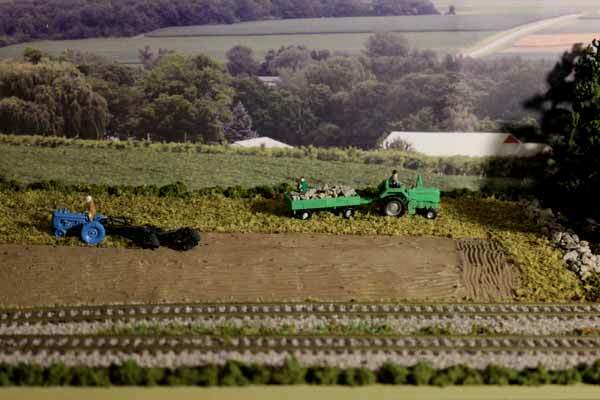 Farmers harvesting field. Looks like cabbage. Have examples of 3D printing projects? Have you used a 3D printer yet? What did you make? Did you use Sketchup or some other software? What was the learning curve like? What pitfalls did you overcome? How did it all turn out? How will you use 3D printing in the future? 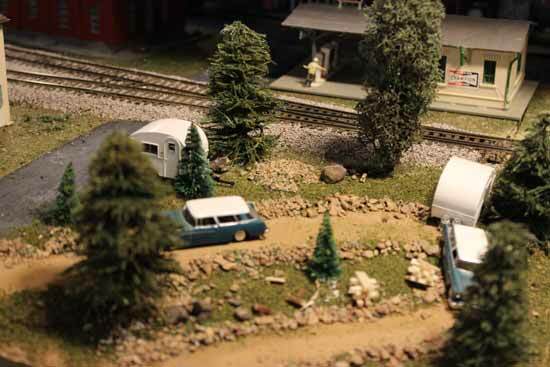 Go from "nottawasaga-model-railway" to history of the Our NMR Club. 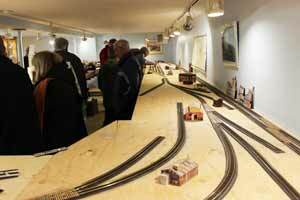 Return from "nottawasaga-model-railway" to my Home Page.